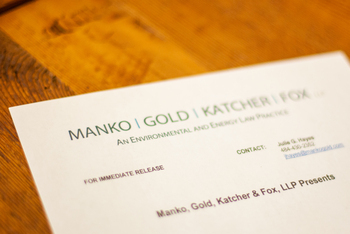 Joseph M. Manko, one of the founding partners of Manko, Gold, Katcher & Fox, LLP (MGKF), the environmental, energy and land use law and litigation firm located just outside of Philadelphia, PA, was presented with the Compass Award from Philadelphia Outward Bound School. The presentation took place on May 6, 2015 at a dinner held at Urban Outfitters at the Philadelphia Navy Yard. The Compass Award is presented to those who best demonstrate the fundamental founding principles of this Outward Bound School: character, leadership and service.